ITMA Asia + CITME is due to be held in Shanghai (China) from 16 to 20 June 2014. At this leading trade fair for the textile industry in Asia 1,300 exhibitors show a broad range of products, solutions, trends and technologies of the textile value chain. On more than 1,000 m2 Groz-Beckert presents its new products and service highlights in hall E5, booth B01. In the center of Groz-Beckert’s show presence stands the "TexCar" – a Mercedes-Benz E-Class model that was rebuilt so that nearly all of the textiles used in its manufacture were laid open. This exhibit allows a free view of woven and knitted fabric, nonwovens and seams, and demonstrates the diversity of textile applications. The use of textiles goes far beyond the "classics" such as seat covers, carpets and car mats. Also in the safety equipment, e.g. airbag and safety belt, textiles and seams are indispensable. Even under the hood and at the wheels textiles fulfill essential functions. In the field of Knitting, a circular knitting machine made of acryl occupies center stage. The transparent nature of the machine allows deep insights in the interaction of all components – Groz-Beckert needles, system parts, and cylinder. 14 knitting technologies are shown, among others bodysize, single jersey and double jersey including several jacquard techniques, as well as a unique gauge gradient on a segment of a cylinder from E10 to E50. Another central topic is the improvement of the productivity in the circular knitting process. On-site each exhibition visitor has the chance to have his individual potential in terms of productivity and saving resources calculated. Moreover, the visitor can discover by himself where unused potentials can be found – which can be tapped by the use of precisely fitting high-quality Groz-Beckert products. Under the motto "Fine-tune your productivity" Groz-Beckert developed an app for this purpose, with questions and answers to the production process. It shows examples of how big the positive effects of minimal changes of the five key factors in the knitting process – machine speed, efficiency, needle life time and breakage rate as well as energy consumption – can be. The questions from the app as also serve for a raffle with attractive prizes during the trade fair. In the field of Sewing, the central theme is SEWING5. 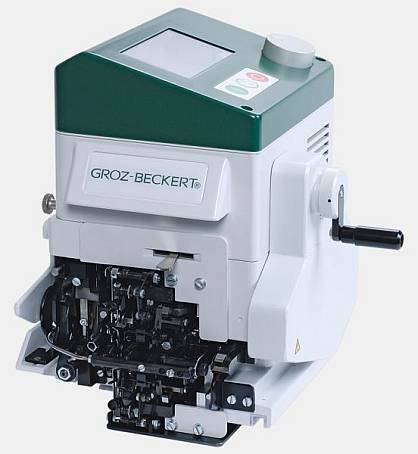 This term refers to Groz-Beckert's comprehensive service plan by which it supports the sewing industry in mastering the challenges in the market – here not only the outstanding product quality and ever more elaborate designs are requested, but also sustainable productivity and efficiency increases play a significant role. The five S of SEWING5 stand for Supply, Solutions, Service, Superiority, and Sustainability. "Superiority", for example, in the view of Groz-Beckert, comprises certified top quality, specialist products, and the application of modern technology. When it comes to quality, even the product packaging can make a real difference. 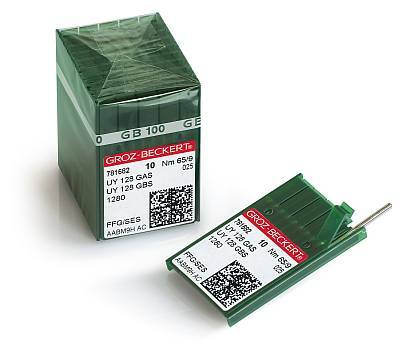 The Groz-Beckert packaging enables needles to be transported and stored securely. As an additional service for customers the packaging label also bears a data matrix code that serves to verify its original product status. The tool needed for this, the newly developed "label scanner", is available worldwide and free of charge as part of the the "myGrozBeckert" app. In the field of Felting (Nonwovens), the focus at ITMA is on specific needle solutions for the automobile industry. The needled nonwovens, visible in the automotive interior, can be structured or flat needled products. Depending on the requirements of the customers in the automobile industry and the application or the desired quality of the end product, different needle types are suitable. The best possible surface quality of flat needled products is achieved with the EcoStar felting needle. If a grainy or velvet-like surface appearance is desired, fork or crown needles are the better choice. For the automobile industry Groz-Beckert is the competent partner for all requirements, oriented to the needs of its customers and synonym for quality, efficiency, process stability, and performance. EcoStar is a universal felting needle for almost all requirements – also outside the automotive sector – and it is the first result of the "Innovations Initiative Nonwovens". In comparison with standard needles, it offers users an improved surface quality of the end product, longer service life combined with reduced energy consumption, and a fiber transport requiring a lower penetration force for the same efficiency. Cleaning, drawing-in, knotting, weaving: For Weaving, Groz-Beckert is full-range supplier for high quality weaving accessories and machines for weaving preparation. These cover a wide field of application. At the exhibition, among other things, Groz-Beckert shows its warp-tying machine KnotMaster. This modular system sets new standards in service and maintenance friendliness. Despite the numerous functions – four tying methods, single and double knots, short knot ends, or the yarn break detector – the handling of the machine is especially simple due to its modern touch-screen control. Thanks to its broad range of application, especially the standard version AS/3 has established itself as a best-seller. It is a warp-tying machine for all fine and medium yarns made from cotton, wool, and synthetic materials as well as for blended and elastic yarns. The highlight at the ITMA Asia is the warp-tying machine in RS/3 version – it is perfect for all warp materials with smooth surfaces, for example fiberglass. Fiber warps can be knotted at a rate of up to 400 knots per minute. The end products of fiberglass weaving are used as base material for truck canvas, tents, circuit boards or temperature-resistant conveyer belts. Since last year, Groz-Beckert has an updated modern website. At this year‘s ITMA Asia the company, for the first time, also presents its fundamentally redesigned app "myGrozBeckert". The previous version of the app was downloaded more than 10,000 times. With the relaunch, the app is now also available for Android devices. In addition, higher priority is given to the customer benefit: The improvements of the app are the new design (adjusted to the website), the quicker access to the requested information and tools as well as the simplified intuitive user prompting. The "myGrozBeckert" app is available in German, English and Chinese and for iOS and Android. Groz-Beckert is the world’s leading provider of industrial machine needles, precision parts and fine tools as well as systems and services for the production and joining of textile fabrics. The products and services support the fields of knitting, weaving, felting, tufting and sewing. Founded in 1852 the company today employs nearly 8,000 people and has a turnover of about €570 Mio. Groz-Beckert operates with agencies, production and distribution subsidiaries in more than 150 countries around the world.